Dennon Oosterman is co-founder of ReDeTec (Renewable Design Technology), a company committed to making Making sustainable and affordable. Oosterman took Engineering Physics at University of British Columbia, and increasingly found himself spending more time in the lab working on projects such as a wall climbing robot, long range UAV, and high gain guitar amplifier. He has always loved making things – he makes his own beer, heavily modifies his own guitar, and is currently working on making his second wooden boat. He has a childhood Lego collection that is “unreasonably large.” His love of the natural world and the outdoors, as well as making are what led to the creation of ReDeTec. ReDeTec is part of the Autodesk Entrepreneur Impact Program, which helps entrepreneurs and startups making a positive impact in the world get to market faster through access to free software, training, events, and co-marketing opportunities. Tell us about yourself and your journey from being an engineering physics student to the co-founder of ReDeTec and inventor of the ProtoCycler. Alex, David, and I were all really lucky to find ourselves in Engineering Physics at University of British Columbia right as 3D printing started to become more accessible to the average consumer. Alex and I in particular really loved making things, and when our lab got a 3D printer, we started using it quite a bit. Between the rest of the program, the lab ended up with garbage bins full of waste plastic from the 3D printers, and we knew we were paying upwards of $50 per spool – so we thought to ourselves, why not just re-use that same plastic? When we were awarded the Bycast Award to promote entrepreneurship at UBC, we knew we were on to something – so we founded ReDeTec, and began development of ProtoCycler in earnest. Plastic waste produced by 3D printed models. What is the ProtoCycler and what problem does it solve? ProtoCycler is a filament creation and recycling system for 3D printers – specifically, the printers that melt plastic in layers (not the ones with lasers, powders, or resins). It lets you take recycled material or raw feedstock – both significantly cheaper than pre-made filament – and generate the filament yourself, safely and easily. 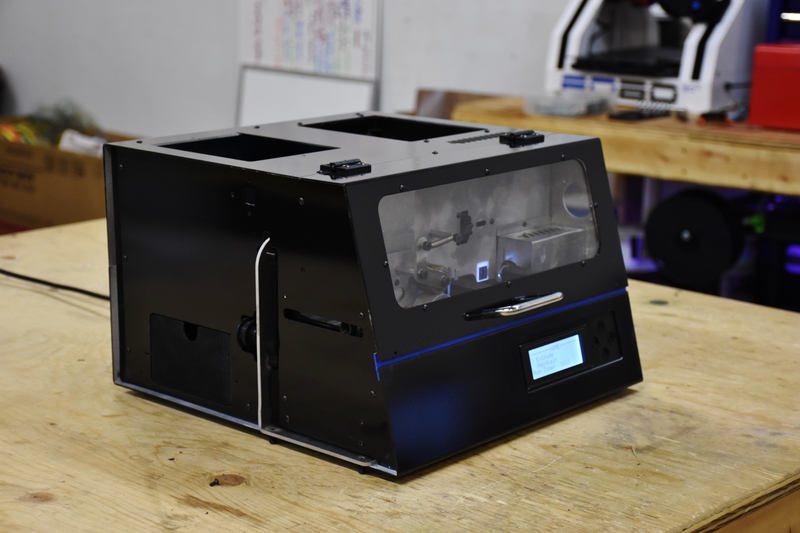 The cost savings alone make it far more accessible to schools, individuals, and small businesses - but ProtoCycler also makes 3D printing a lot more sustainable. It encourages you to innovate more and use the technology more, because a mistake or obsolete prototype no longer means a waste of money and materials when you can just recycle it! And, perhaps most importantly, it makes 3D printing a lot more fun – you have full control over the color, can experiment with different materials, and really unleash your creativity. The ProtoCycler recycles plastic waste to be re-used in 3D printing. What’s your design process like? How are you using design thinking and how does Fusion 360 help you in your design process? Every time we go to Autodesk University, I think we're the only ones that map out our specific design process on the boards they have, but we think it works really well for taking massive steps forward with minimum effort or waste. We start simply – pen and paper, or whiteboards – just to get the ideas out. Then we switch to a combo of Autodesk Inventor and Fusion 360 for the middle stages. Inventor is a bit more robust for when we need some serious mechanical design work done, but Fusion 360 makes it much easier to collaborate with our industrial designer and have everyone working together to create a cohesive product instead of just some functional machinery. Once we're fairly happy with that, we use 3D printing and a CNC mill – usually powered by Fusion's CAM or HSM Works – and prototype our design for testing. Then lather, rinse, repeat...until it's perfect! What’s your favorite phase of the design process and why? That's a really tough question – they're all great. The speed at which you can move with pen and paper is phenomenal. And then watching that quick and dirty napkin sketch turn into something real in Fusion or Inventor is really cool, because now that idea is starting to take form and you get to delve into all the (usually critical) details you forgot when you were just sketching out concepts. But I think my favorite part is the testing, particularly when it fails. A successful test is great, but you don't learn anything or get to have those “Aha, now I get it!” moments. A failed test means that you learn an incredible amount in real time, and you get to have more fun designing again. And of course, if things go really badly, it can be pretty entertaining! What are some of the trends you are seeing in the world of 3D printing in response to sustainability design and manufacturing practices? I think 3D printing allows us to move orders of magnitude faster, and create novel solutions to problems we otherwise couldn't accomplish. Autodesk has some great examples with their generative design – the new bulkheads used by airbus, the rocket thruster example, and many others are all designs that could not exist in reality without 3D printing...and yet they're already here, never-mind theoretically possible. And they're saving weight, manufacturing time and cost, and ultimately money at a rate we never thought possible. What advice would you give to emerging designers and students who are entering engineering and design fields? Strive for failure, as fast as you can. Having seen both the business/finance, and engineering/design side of things, each half wants the polar opposite of the other. Business and finance want it as cheap as possible, yesterday...and Engineering/Design want it perfect, fully solved, the ideal solution. If you can churn out the bare minimum ASAP and then quickly test it thoroughly, you'll end up with a much better idea of the problem you're trying to solve – which means you can solve it better and faster, making everyone happy! That's sort of what we're trying to do with ProtoCycler and 3D printing – test 10 ideas for the same cost as 1, so you can learn as much as possible in the shortest time, and really ace that 11th attempt. I guess you could call it iterative design, with an explicit focus on moving fast and breaking things. The ProtoCycler is a key part of the design process, from sketching, to 3D modeling, to prototyping. Have an idea for a product? Design it in Fusion 360.